Taking your eye out of the picture is one of the better card making ideas. 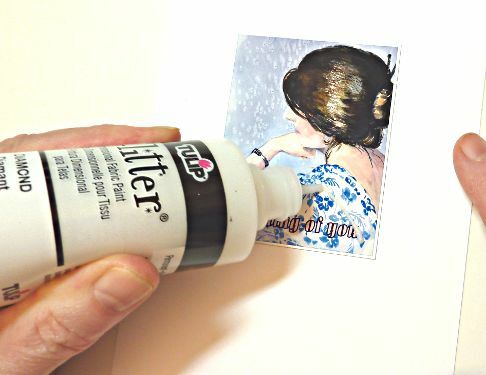 It's a technique that has been used to great effect in regular artwork, but it still hasn't been used to the same degree in making greeting cards. 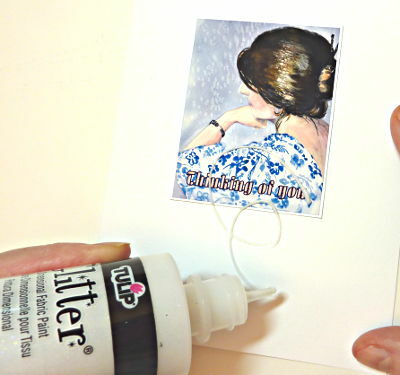 Using glitter scrolls is a simple and very effective way of achieving this technique. It's quick, easy and fun to do and it makes your cards different. 1. 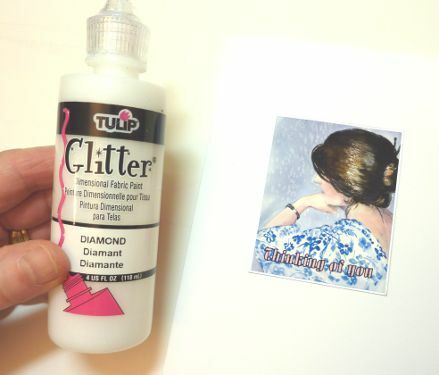 I use this Tulip Diamond Glitter fabric paint for much of my enhancing. 2. Here I'll use it over a gentle image of my daughter and the words "Thinking of You". The glitter will brighten the overall effect of the card. I begin at the end of the word "You" and start a scroll shape, a loop or an "S" shape works. 3. Practice on a scrap of paper and see where your hand and arm lead you. There isn't a wrong way as long as your curves are unbroken.